BOSTON – Tuesday, April 4, 2017 – Mayor Martin J. Walsh and city education stakeholders today announced a groundbreaking new learning collaborative joining together Boston Public Schools, charter and Catholic schools in Boston to share and support best teaching practices and professional development across city school sectors. Mayor Walsh joined Boston Compact leaders, including Superintendent Tommy Chang, the Boston Charter Alliance, and the Archdiocese of Boston schools, along with Teach Plus, at the Mission Grammar School to launch The Boston Educators Collaborative (BEC). 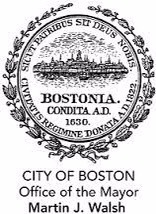 The Boston Educators Collaborative was established through a partnership with the Boston Compact and Teach Plus, and will recruit, select, train and support outstanding Teacher Leaders to facilitate professional learning for their peers. Through the Collaborative, selected teachers will lead five-week, 15-hour university courses on key topics that ensure instruction reaches all learners, provides rigorous curricula and is culturally proficient. These courses will help foster the collaboration across all three sectors–district, charter and Catholic schools–and bring the skills back to the students in classrooms across the city. “Our students are our number one priority, and our teachers are our number one asset. Both will benefit from collaborative efforts like these that focus on improving the quality of education children receive no matter where they go to school,” said Shannah Varón, Executive Director at the Boston Collegiate Charter School and Chair of the Boston Charter Alliance. “The Boston Educators Collaborative is a great way to strengthen our teaching in all classrooms-we’re excited to work with the other sectors to impart our strengths and create a stronger education system across the city,” said Kathleen Power Mears, superintendent of Catholic Schools for the Archdiocese of Boston. Six courses will begin in May, including ‘Culturally Responsive Teaching: How Does Culture Play a Role in Learning?’ and ‘How to Use Student Talk and Differentiated Checks for Understanding to Elevate Mathematical Thinking for All.’ Additional courses will be offered throughout 2017 and 2018. For course descriptions and to register, please click here.